Be the first to share your favorite memory, photo or story of Vonnie. This memorial page is dedicated for family, friends and future generations to celebrate the life of their loved one. 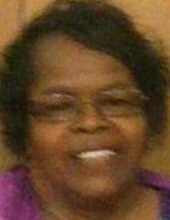 Vonnie Mae Hamm Jordan, 75, of the Bogue Community, Newport, departed this life on Saturday, April 13, 2019. Vonnie Mae will be forever cherished by: one son, Carlton Augustus Jordan, Jr. of the home; one daughter, Carleta Jordan-Angline (Wendell) of Garner; one brother, Frankie A. Simmons, Jr. of the home; three sisters, Marie Simmons of Reading, Pennsylvania, Macy Lacy of Hamden, Connecticut and Viola Midgette (Abraham) of Morehead City; and a host of other relatives and dear friends. Viewing will be held on Thursday at the Church one hour prior to the service. The service Celebrating the Life and Legacy of Vonnie Mae Jordan will be held on Thursday, April 18, 2019 at 1:00 PM in the Spring Garden Missionary Baptist Church, 250 Bogue Loop Rd., the Bogue Community, Newport. The interment service will be held on Monday, April 22, 2019 at 12 Noon in the Coastal Carolina State Veterans Cemetery, 101 Montford Point Rd., Jacksonville. Professional Service and Personal Care are being rendered to the Jordan and extended families by the staff of Morgan Funeral Home, Inc. and Cremations, 150 Williamsburg Parkway, Jacksonville (910) 347-9595. To send flowers or a remembrance gift to the family of Vonnie Mae Jordan, please visit our Tribute Store. "Email Address" would like to share the life celebration of Vonnie Mae Jordan. Click on the "link" to go to share a favorite memory or leave a condolence message for the family.